Two years. Two years simultaneously feels like quite a long time and also like a blink & a bang. A few weekends ago, G & I jetted off to Raleigh & Saxapahaw to celebrate our two years together. Surreal, no? I wouldn’t trade him for the world. The trip started off ominously enough–we took a half day on Friday and planned on finding this amazing sounding BBQ place on the way down in Boones Mill. No dice. Guess they closed shop. With no BBQ to be found (and 20 minutes wasted driving the half-mile stretch of 220 trying t find the place), G & I were a little beyond bitchy with no food. Each little mom & pop we passed, we didn’t stop, finding one or another thing wrong with it, and the hunger put us in a rough spot. Seriously snappy. But then, miracle of miracles, a tacqueria in the Middle of Nowhere. No idea the name of it and it’s not on Google Maps, BUT, if you’re south of Rocky Mount on 220 heading towards the NC border, you’ll find on your right a little Mexican grocery store chock full of bulk beans, chorizo, locally-made tortillas, and a taqueria. Not many options–steak or pork–and we tried both. 4 tacos for $6, you can’t beat it. 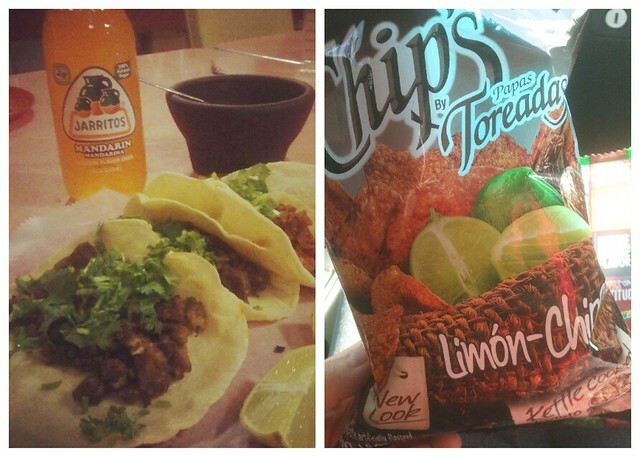 Top it off with a Jarritos and you’re set. Oh, and be sure to pick up snacks for the road–these kettle cooked Lime-Chipotle chips are the jam, as are the jalapeno variety. Tip no.1: tacquerias can save a relationship. Visit often. First stop in Raleigh: Beasley’s Chicken & Honey. A sister restaurant of Chuck’s and Poole’s Diner, Beasley’s specializes in southern-style chicken dishes and mouthwatering sides. No camera in tow because the Hopscotch Festival venue wouldn’t allow them, I settled for some pretty crappy Instagram photos. They don’t do the meal justice. My anti-Chick-fil-A Chicken Biscuit with Pickled Green Tomato, Dijon Mustard, & Honey served with Hook’s 3-Year Pimento Mac n’ Cheese Custard totally blew any chicken biscuit (and mac n’ cheese) that I’ve ever eaten out of the water. 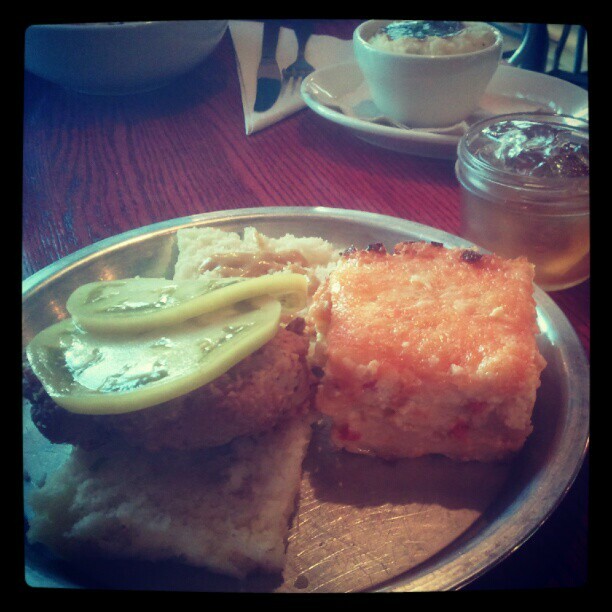 The biscuit was flaky and soft, the chicken fried to a golden crunch, and that pickled green tomato–the acidity was a home run. 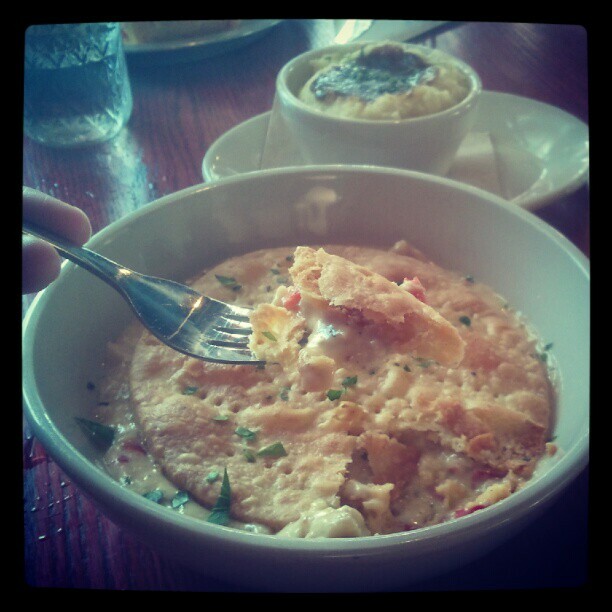 As for the mac n’ cheese, I’ve never eaten a pimento mac n’ cheese before, but now I think I need to more often. Rich and creamy with that tangy bite I love pimento cheese for, I couldn’t have been a happier woman. G ordered the Chicken Pot Pie w/ Milk Gravy & Cornmeal Pastry Crust with Mashed Potatoes& Gravy, and, while not as good (in my opinion as the chicken biscuit), it was a solid chicken pot pie. I grew up loving the Marie Callender’s frozen ones, so, really, I shouldn’t be allowed to judge a pot pie, but the crust was flakey, the chicken and vegetables tender, the milk gravy rich and smooth. An elevated homey dish. Did I mention the cocktails are served in canning jars? Oh yes, the place is darling. But not too darling–the food takes center stage. 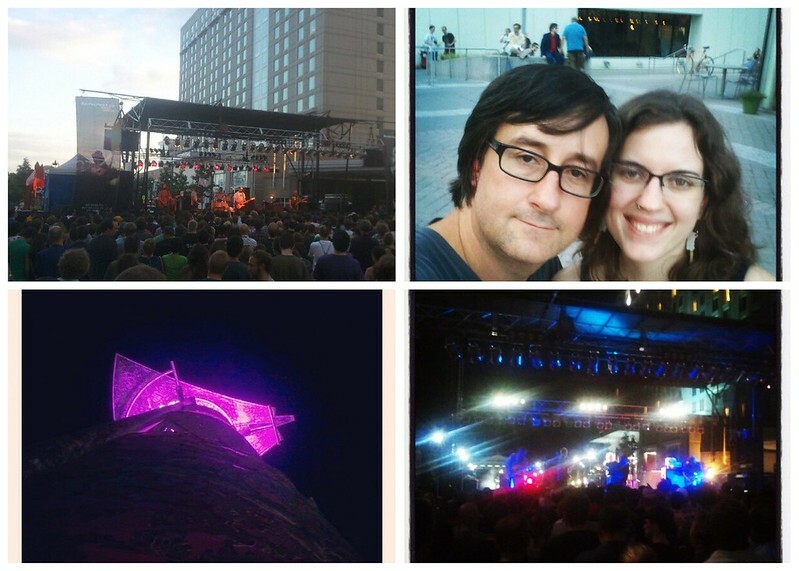 After Beasley’s it was off to see Built to Spill and Jesus & Mary Chain. Tip no.2: relationships are a lot easier when you like the same music. This was my second time seeing Built to Spill and I was happy that Doug Martsch played a lot of older songs (not just stuff off his most recent album). 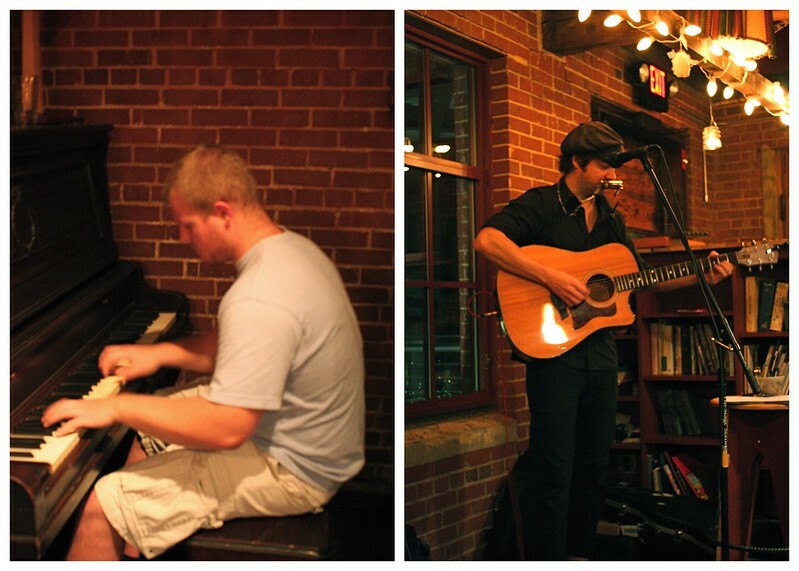 Funny story–G & I saw them play at the very beginning of our relationship two years ago. That worked out nice, no? As for Jesus & Mary Chain–that show was amazing. Loud & racous & with fantastic energy, I even scored a perch on a pillar in the square and no officer asked me to get down. Hallelujah for being able to see the stage. And get drunk while standing on the tall base of a pillar. The next morning we actually managed to sleep in long enough to skip breakfast and dive into lunch at Chapel Hill’s The Pig. I’ve sung love ballads about the restaurant before and this time was no different. 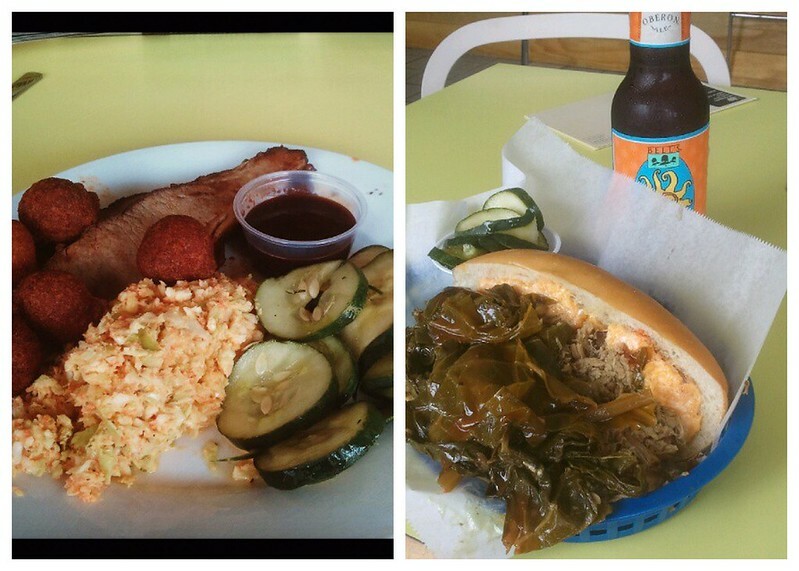 My Carolina Po Boy featuring pimento cheese (oh you know it), pulled pork, collard greens, and hot sauce was phenomenal–I’m now convinced that pimento cheese, pork, and collards should always go together, especially in a giant sandwich. G’s brisket (who orders beef at a place called The Pig) was actually fantastic too–moist with a nice char on the edge, I’ve never had better brisket. Stuffed, we headed off to Saxapahaw to spend the night at the River Landing Inn and continue the eating fest at The Eddy. 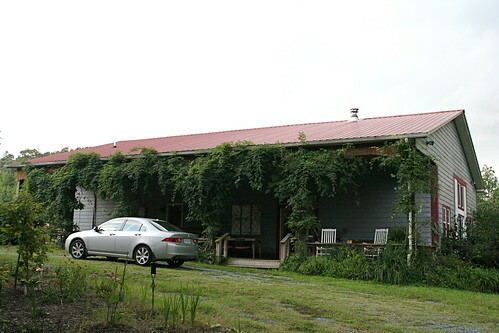 The River Landing Inn is a converted horse barn with three different rooms. Ours was on the small side, but I loved the clean, simple comfort of it. 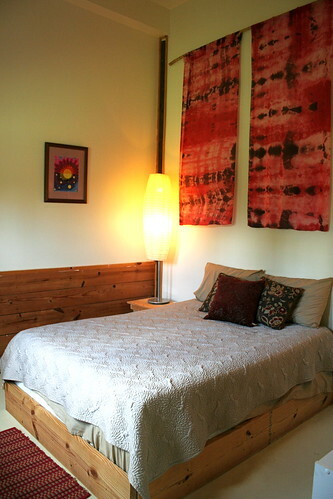 No frou frou here, not kitsch, just white walls, tapestries, and lots of wood. My kind of place. Tip no.3: bring a box of wine if you’re staying at a B&B. No really, it’s so easy to transport when you drive back home and, if you’re like me, you’ll need a few glasses to accompany the late summer storm. 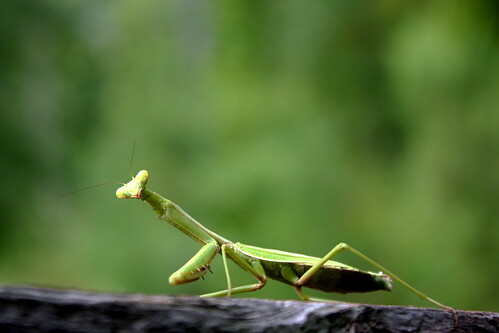 Oh, and finding praying mantises to play peek-a-boo with doesn’t hurt either. Wined & rested, we hopped over to The Eddy (which I’ve also raved about before) for dinner & wine & amazing music. 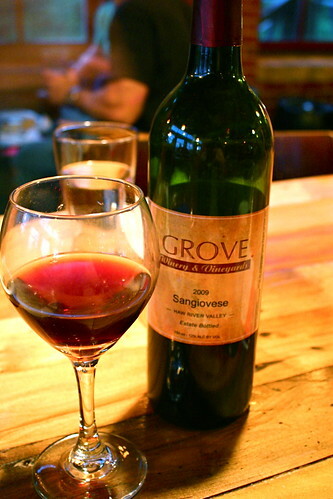 No cider this time, but a bottle of Grove’s Sangiovese (a local winery). Easy drinking. Easy listening too. For the first half of the meal, a (local? Anyone in Saxaphaw know this guy?) pianist played music that seemed like a marriage of George Winston and Philip Glass–two of my favorite pianists. He played for an absurd amount of time without stopping; I have no idea how he did it, but I’m in awe. Afterwards, Brooklyn-based John Dyer played (singer-songwriter guitar/harmonica style) & we ended up staying later than planned in order to catch most of his set. You can find him on Spotify or other streaming sites–check him out! British cheese plate to start (I, of course, forgot to keep the menu or write down notes, arg), followed by Bangers & Mash and a Lamb & Beef Shepherd’s Pie–all locally sourced, of course. The cheese plate, I know, featured Red Dragon, a cheddar with mustard and ale, as well as a stilton and sharp cheddar. I might go to hell for this, but I really do prefer English cheeses to French ones. Not that I don’t like a stinky, creamy cheese, but the strong, sharp flavors of most British-style cheeses just hit home for me. 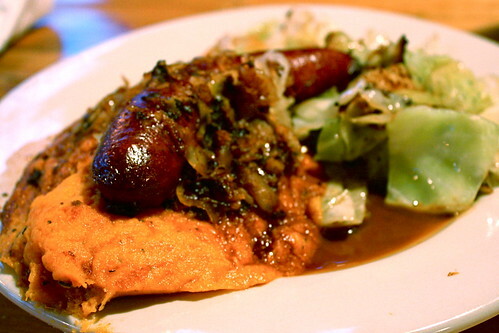 The Bangers & Mash featured a Saxapahaw-raised pork sausage (it was supposed to be a bratwurst, but ours definitely wasn’t) with sweet potato mash & butter-braised cabbage. The sauerkaut was mixed into the sauce drizzled on top, so there wasn’t much of that to go around, but the sweet potato mash was otherworldly–so buttery, so much like the ones I ate in Versailles this past March. The sausage had a good snap in the casing and was rich and slightly spicy, perfect for the rainy, dark evening, and we’re both big fans of cabbage, so no complaints there. Following the theme of rainy night comfort food, the Shepherd’s Pie was chock-full of spiced ground beef and lamb with peas and carrots for color. And that generous dollop of buttery mashed potatoes baked on top? 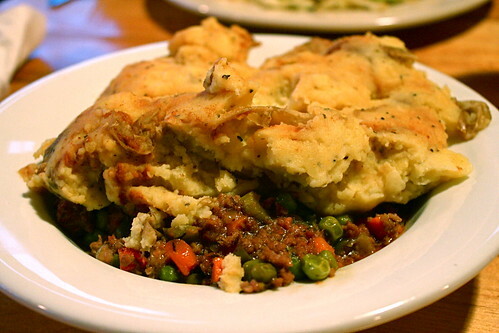 The epitome of a perfect shepherd’s pie. The Eddy, you do me right every time–how much fatter I’d be if I lived even remotely close to you. Sated, we rolled ourselves back to the Inn and washed down the evening with another porch sitting of wine. Tip no. 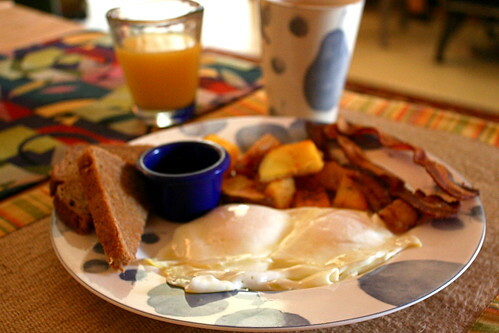 4: Make your partner happy with a locally-sourced breakfast that neither of you have to make. B&Bs are more than worth their (sometimes) extra cost. Breakfast at the River Landing consisted of dark coffee, pulpy orange juice, eggs cooked your way, toast, bacon, and potatoes. 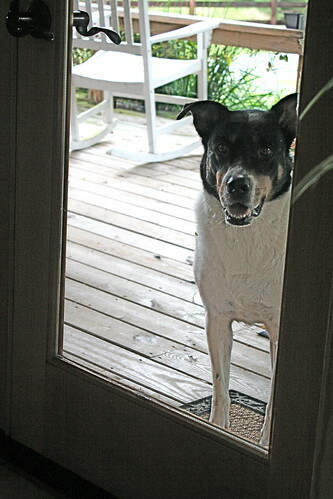 Oh, and an outdoor dining companion who seemed dejected that we didn’t let him in and feed him. I have no idea how I managed to eat it all after the previous day’s indulgences, but those bright orange yolks don’t eat themselves. Food, food, and more food, I swear we actually kayaked that Sunday thanks to Haw River Canoe & Kayak. 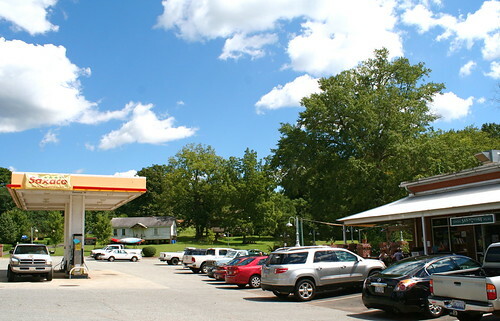 But a lazy river paddle needed, of course, to be followed by lunch, so we happily explored the options at the Saxapahaw General Store & Gas Station. Yes, gas station. Definitely home to (possibly), the best gas station food in America. 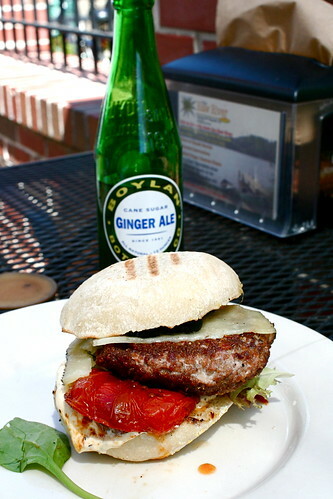 Saxapahaw is local foods heaven. The General Store features more casual, slightly cheaper fare than the Eddy, and, like The Eddy, is very vegetarian/vegan friendly, but, like my evening at The Eddy, I opted for the incredibly meaty goat burger at the suggestion of a reader. Topped with manchego with roasted red pepper, spicy mustard, and frisee, the burger (though unfortunately cooked well done when I asked for medium) was still juicy and yet lean, a paradox of sorts. 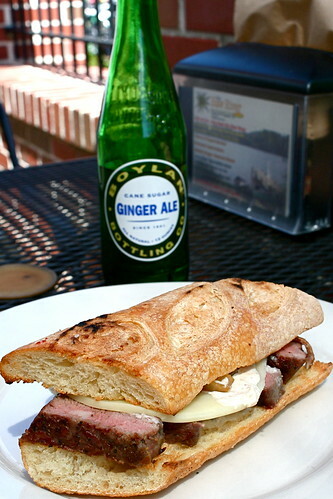 G’s Rare Roast Beef with provolone, banana peppers, pickle, and tomato was equally delicious. At this point we had no choice but to head north towards home, but not until after one farewell to the Haw River. Like last time, I’m itching for any excuse to return, if only for a dinner at the Eddy and a good night’s sleep at the River Landing. Tip no.5: Fall in love and stay in love–it’s worth it, even during the disagreements and the long car rides when you just need lunch. Sounds like a trip that me and my hubby would have had! Here’s my wish to you for many more years together! Aw, happy anniversary! It looks like you really did it well. Never really listened to Built to Spill but I LOVE Jesus & mary chain. None of the food is actually something I could have eaten while in Raleigh but I’m glad you both found something to tide you over and stave off a snappy, low-blood sugar level fight, and it’s nice to see shots of the greenery. Happy anniversary! This is making me want to spend a lot more time in Raleigh–my little brother lives there, but since we live on the opposite coast, it just doesn’t happen that often. But all those deliciousnesses! Getting grumpy hungry together and seeing it through without each other – that’s love. I had to laugh at the British cheese plate – I was just trying to explain to some Brits how Americans don’t get the “cheese for dessert” thing. 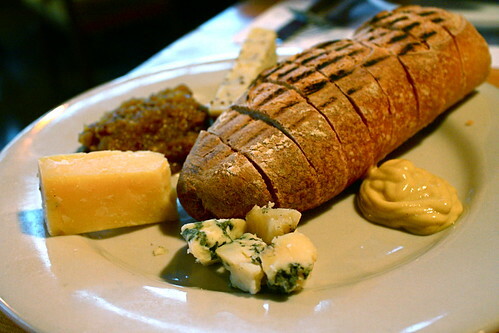 Meanwhile, said Brits were confounded by our willingness to treat cheese as an appetiser. Solution: have Brits and Americans over at once. That means two guaranteed cheese plates. Happy anniversary! Happy anniversary – you guys seem like a great couple! 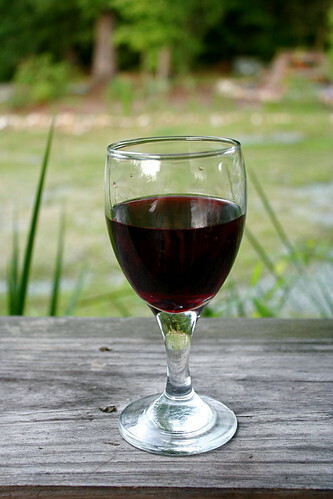 I had to laugh about taking the boxed wine to the B&B – a few days ago I was talking to my friend about how I’m planning to take a box of wine on the plane when we go to Puerto Rico in a few weeks, where we are staying in a B&B. All of our meals will be provided by the B&B and I was worried we wouldn’t have enough (or, gasp, ANY) wine. We’re totally into the boxes, too: it would seem weird to me to buy a bottle of wine at this point. I love having it on “tap”. Does this comment make me seem like a lush? You guys know how to food travel like crazy! Seriously, I’m all jelly from the local stuff you have available. Also, totally wise advice about the boxed wine. They make good boxed wine these days, and it’s soooooo durable! Congratulations you two, and good taste in music. Boylan Sodas are great! They are made with pure cane sugar and they taste soooo good!